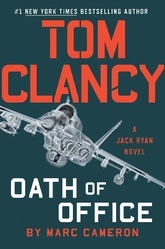 Can Jack Ryan rescue his son? As protests break out across Iran, members of Congress and the Cabinet rejoice over the so-called Persian Spring. Only President Jack Ryan remains wary. Meanwhile, a deadly strain of flu sweeps across the U.S. as spring floods ravage the Southeast. An unethical senator is willing to use bot-planted stories to bring down the Ryan presidency. But the scariest story is closely guarded: Two Russian nuclear missiles have been hijacked. Jack Junior connects with a rogue Russian intelligence officer in Afghanistan—only to be abducted. John Clark and the Campus team race to track the missiles and rescue their colleague. President Ryan faces his toughest challenge: How do you meet an enemy head on, when he won’t show you his face?